I have joined The Natural Dye Studio's Sock Club and my first yarn arrived for the August sock. It is a beautiful merino 4 ply called NINO. Here you can see the colours inspired by August flowers and foliage. I think it is so evocative of the August heat haze with the ripening of fruits such as blackberries and the golden wheat fields together with the muted summer greens. I am more than happy with this yarn and have decided to use a pattern I downloaded a few months ago from Black Dog Designs by Nora called Picot Eyelet socks. 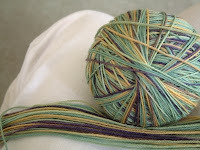 The yarn is soft and easy to knit. The wool came with a set of Surina Wooden Double Pointed-Knitting Needles in size 2.5mm (7 inch length). I will try to get some coffee or mocha coloured ribbon to thread through as I love socks with ribbons. 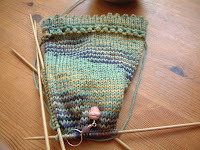 The progress of the socks as you can see below is very pleasing.